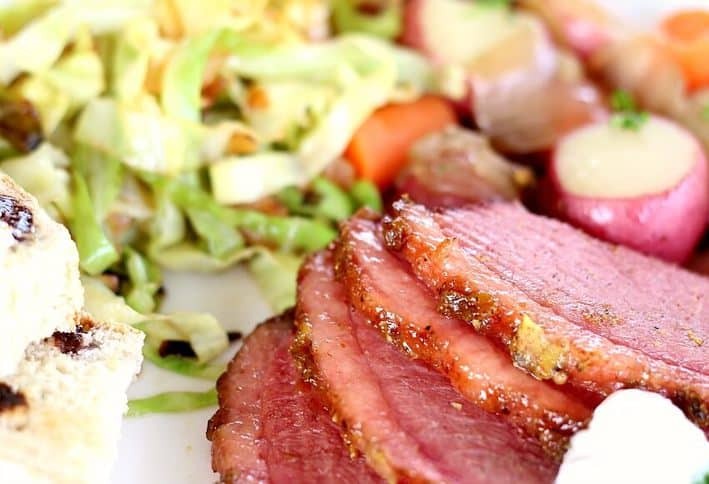 Corned Beef Brisket is one of the easiest meals to get right. 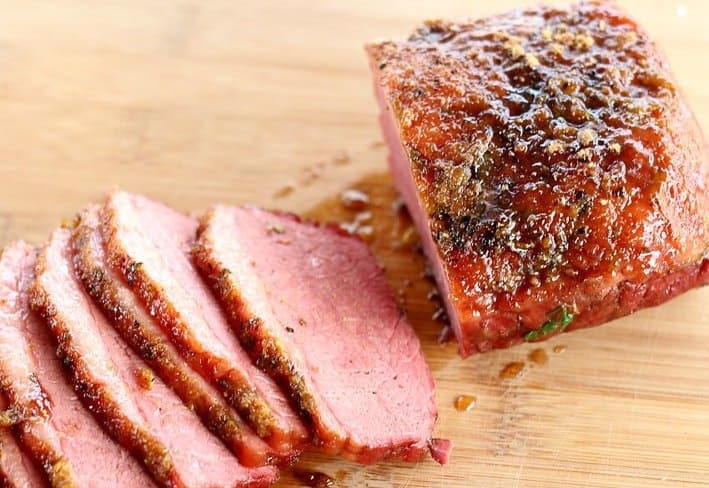 Beef that’s brined with rock salt the size of corn kernels (hence CORNed Beef) is unbelievably tender and flavorful. This method of boiling the meat for several hours produces a brisket that is fork tender and the remaining juices are a delectable bouquet to simmer finishing vegetables like baby red potatoes, carrots and onions. Cabbage is another traditional side for my ‘Emerald Isle Corned Beef Dinner’ and I prefer sautéed cabbage, but you can add the cabbage into the pot with the other veggies. I give instructions for both methods in the printable recipe. The corned beef shown here is a small 2 pounder for just 3 people, but usually I buy a 5 or 6 pound flat-cut brisket. To get the meat started, I place the meat with the seasoning packet that is included in a heavy bottom dutch oven-type pot. I also add a lot of aromatics of my own, not to mention some onions and garlic. This seems too simple, but just fill the pot to cover the meat with water or a combination of dark beer and water, put a lid on it and simmer for approximately 4 hours, turning occasionally. It’s hard to overcook the brisket for Corned Beef Dinner. In fact, if the meat is ever not tender enough, it means I didn’t cook it long enough, so keep that in mind. Once the meat has finished its boiling bath, slather on some spicy mustard, pepper, garlic salt and brown sugar. Then into the oven for a few short minutes will give the fatty top a golden crust. While the brisket is finishing in the oven, add carrots, red potatoes and pearl onions to the leftover liquid and boil until tender. 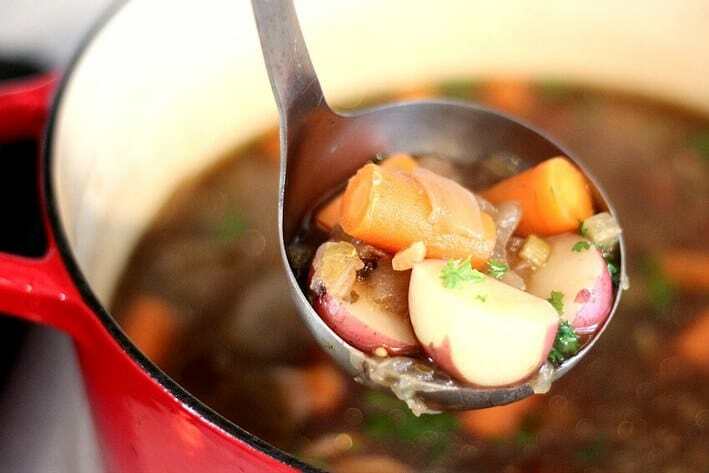 The flavor from this leftover stewing liquid adds rich and rustic over-the-top flavor to the vegetables. Serve with traditional St. Patrick’s Day dinner sides of veggies, cabbage and don’t forget the Irish Soda Bread. Or…. forgo the extra vegetables and slice the meat super-thin for homemade Reuben sandwiches. I’ve been serving my Emerald Isle Corned Beef Dinner for more years than I can count. It gets requested several times a year, actually. Irish Corned Beef Dinner all in one pot? 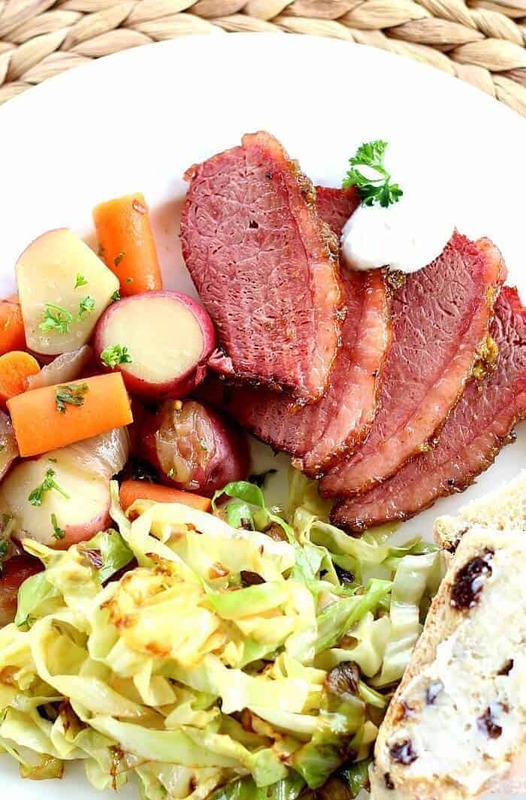 Not only will the Corned Beef Brisket be perfectly moist and tender, the side dish vegetables will be bursting with flavor after simmering in the same pot as the brisket. Easy and foolproof. I would also find a large head of cabbage rather than the small head called for in the boiled method. Slice the cabbage before starting. 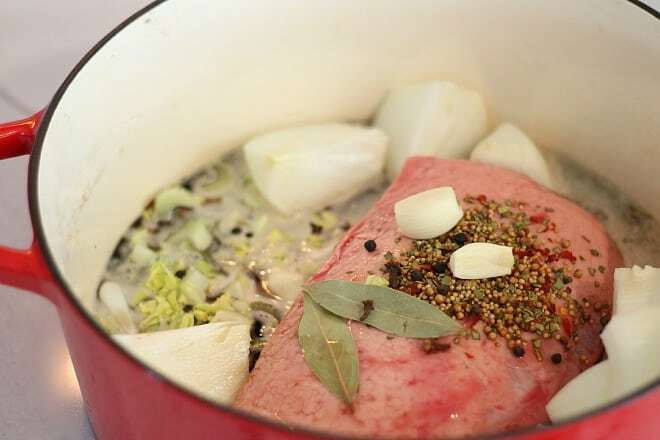 Remove corned beef brisket from package, and place in large dutch oven-type pot. If the corned beef came with a seasoning packet, empty that over the beef. Add the quartered onions, celery, garlic cloves, peppercorns, whole cloves and bay leaves. Next add the beer if you're using it, then add enough cold water to completely cover the meat. 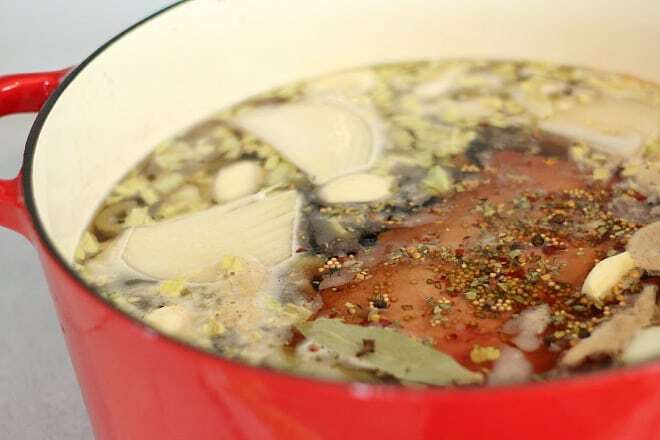 Bring the pot to a boil, cover, reduce the heat to simmer, and cook up to 4 hours, or until the internal temperature reaches at least 160F degrees. During this process, turn the meat a couple of times, about every 1 1/2 hours. Cook's note: Simmering the meat more than less will result in a very tender corned beef brisket, I have found over the years. Any time the meat has been less than tender, it's been because I rushed it. The boiling process will break down and render the fat to be very tender and almost disappear with time. You'll begin to notice this each time you turn the meat. At the first turning, the meat is almost stiff as a brick. 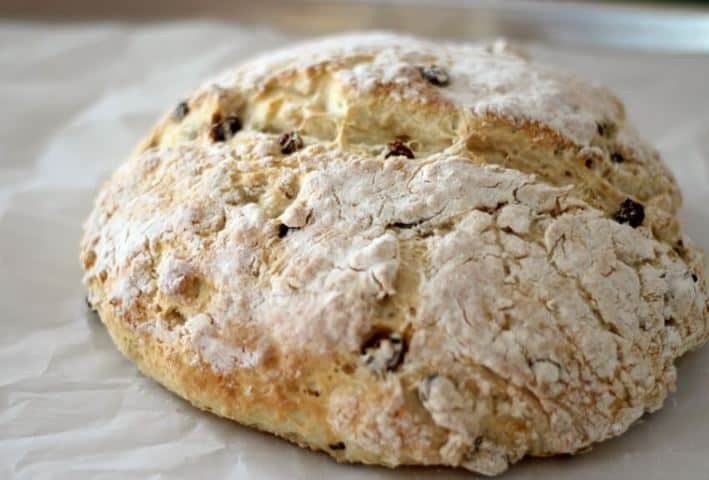 Make Irish Soda Bread while meat is cooking. Recipe below. Also, stir desired amount of prepared horseradish into sour cream or yogurt and refrigerate until ready to serve. 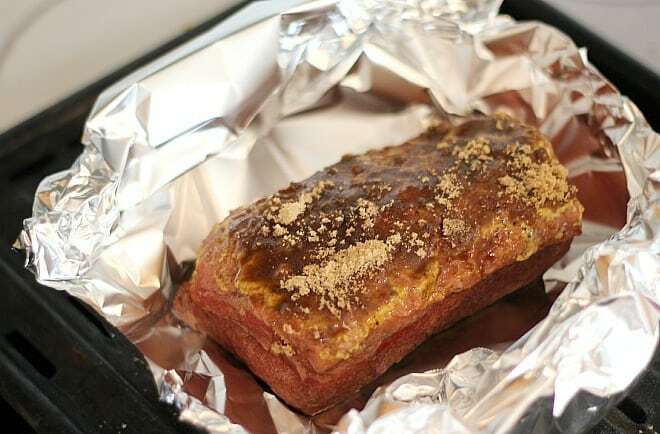 After meat is tender and has cooked the appropriate time (or more), remove from water and place on baking sheet or roaster pan to rest, fat side up. Pre-heat oven to 350F degrees. Bring the water back to a boil and add the red potatoes and carrots. Cover, reduce heat to medium and simmer until tender. Place meat on a serving platter or cutting board. Slice thinly, about 1/4 inch thick. Using a slotted spoon, remove vegetables into a serving bowl. Serve meat with horseradish-sour cream mixture, vegetables, Irish Soda Bread and creamy soft butter, if desired. Leftover meat is amazing the next day. Heat 2 Tablespoons olive oil on medium high to high heat in a large, wide pot or large, high-sided sauté pan. Add chopped onions, cook for a couple of minutes, then add garlic. Add a third of the sliced cabbage to the pan. Sprinkle with a little salt and stir to coat with oil and mix with onions. Spread out the cabbage evenly over the bottom of the pan and do not stir until it starts to brown. If the heat is high enough, this should happen quickly. The trick is to have the burner hot enough to easily brown the cabbage, but not so hot that it easily burns. When the bottom of the cabbage is nicely browned, use a metal spatula to lift it up and flip it, scraping the browned bits as you go. Once the cabbage in the pan has browned on a couple of flips, add another third of the cabbage to the pan. Mix well, then spread out the cabbage and repeat. Add a bit of butter to the pan for flavor, and to keep the cabbage from sticking too much to the pan. Once this batch has cooked down a bit and browned, add the remaining third of the cabbage and repeat. This is a very quick, sweet bread that goes perfectly with Corned Beef Brisket Dinner. Don't pass this up, you won't be sorry. 1 1/2 cup fresh buttermilk I have only used real buttermilk here, so cannot speak to whether buttermilk substitute will be sufficient. Pre-heat oven to 350F degrees. Place parchment on a baking sheet, or lightly grease and set aside. In a large mixing bowl or in the bowl of a stand mixer, place all dry ingredients in the order listed. Add the raisins and give everything a quick whisk. Add all 1 1/2 cup buttermilk and on low speed, mix until it forms a soft dough, about 30 seconds. You can do this by hand if you like. There will/may be some dry ingredients and possibly a few raisins that just won't mix in. That is fine. Turn dough out onto a lightly floured surface and knead just until it's a smooth ball, only another 20-30 seconds. Place the ball of dough onto the baking sheet and press to spread and flatten the dough. Slash the top with a sharp knife. Pat the top with some of the excess flour. This will give the bread a nice rustic finish. 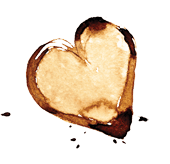 Bake for 40-45 minutes, until bread is just golden. Remove from oven and let cool for 15 minutes before slicing. I absolutely love the topping on the corned beef! 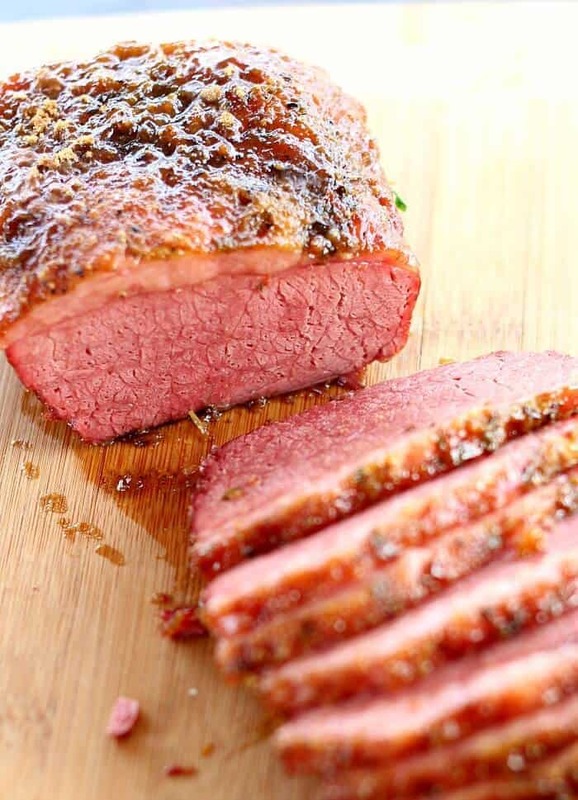 This is absolutely the BEST Corned Beef recipe that I have found. Thank you so much for sharing. This has become our new family tradition!